Nicole Eisenman, Sketch for a Fountain, 2017. Photo: Henning Rogge. Nicole Eisenman’s large-scale outdoor sculpture Grouping of Works from Fountain will be permanently installed at the redeveloped 401 Park building in the Fenway neighborhood of Boston in late spring. 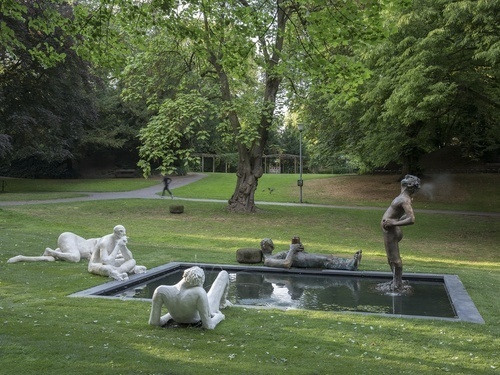 The work is an iteration of Eisenman’s Sketch for a Fountain, which made its international debut at Skulptur Projekte Münster in 2017. Featuring several monumental figures of bathers situated in various positions of repose around a shallow pool of water, Grouping of Works from Fountain will be situated in a new public park adjoining the 1920s-era building and former home of Sears & Roebuck Co. that was bought by Samuel & Associates. The Boston-based firm has transformed the one-million-square-foot structure into an office building, boasting the new Time Out Market food hall and a 1.1-acre green space. To read more about Eisenman and her work, check out Johanna Fateman’s piece in the April issue of Artforum.